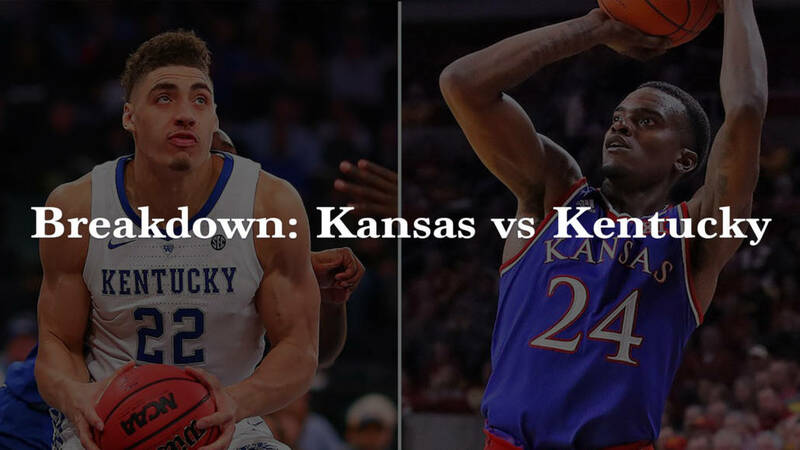 Kentucky took down Kansas through their length and size, and Kansas tried everything to stop them – including a Triangle & 2 defense. Kentucky does not run anything fancy, but it is very effective and impactful for the personnel Calipari has on a year to year basis. Bill Self has better X’s & O’s in my opinion, but Kentucky’s ability to defend and crash the offensive glass really hurt Kansas. In this breakdown we will look at some of my favorite sets from the game, skills and concepts that we can take away and learn from. Kentucky outrebounded Kansas on the offensive glass 17-9 led by Reid Travis and PJ Washington, built on Kentucky using their length and size advantage. One of the biggest things to take away from Kentucky’s offensive rebound advantage was positioning and lower body control. Not only having a relentless effort, but knowing where to be when the ball is shot as well as exploding and recovering from the lower body gives the rebounder a huge advantage. A counter to Kentucky’s best set from last year (Boston) was a good way they created a post up opportunity. The set starts off with an Iverson cut, or a cut from a guard over the top of two bigs toward the top of the key. As the guard clears, the second big lifts to the top of the key and receives a pass from the point guard. Opposite of this action the other big sets a pindown screen for a guard – typically Herro – and then post up no the weakside. The screen down sets up the bigs defender to be on the high side since teams usually defend a pin down with the big showing a hand on the high side and recovering, allowing the screener to seal. When I first saw this set I was not sure if it was actually a set or just a random action that allowed a baseline drive due to a defensive breakdown. I think it is a set – still trying to find another example of it, but even so it is a good action to show how a baseline drive can impact a defense. The play is designed for a hand off on the wing, then a guard filling behind and kicking back to the point guard who attacks baseline. The reason I think this is a set and not just random is where the big for Kentucky is located – high above at the free throw line, allowing the baseline drive. Bill Self went to a Triangle & 2 Defense against Kentucky to try and muck up Kentucky’s offensive flow and it was impactful. Kentucky did get some good looks out of it, but ultimately it stymied Kentucky’s run in the second half and at least made them think about how to attack it. 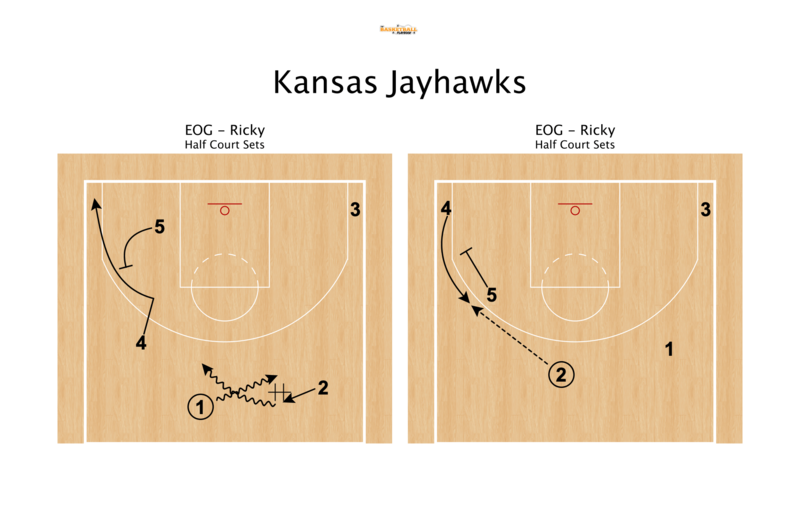 A normal set that Kansas runs is a wide flare set with a guard attacking, having the big set it wide to the corner and prevents his defender from helping too much at the rim. Late game against Kentucky, Kansas went to this same flare action but instead had a rescreen action to get Vick an open 3 and pull closer. Two things I learned from this game that I will take away, both from Kansas. The first thing is to always teach your players to have their heads on a swivel and remain disciplined in their passing. Dotson threw the ball to Garret who wasn’t looking for the ball. I am going to teach my players to always cut and act like you are going to get the ball every possession. The second thing is a great example of how to trap in a full court press without fouling, and Kansas forced Kentucky to take a late game timeout. I hope you guys enjoyed this breakdown, I look forward to getting more in depth with these – and if you have any feedback let me know!